As soon as I found out we were going to Silver Beach, I told J we were getting pizza. We ended up trying to go for lunch, but there was quite a wait. We didn’t want to sit around with three kids so we went somewhere else. Still, I was determined. I wanted Silver Beach Pizza. I’ve heard so many good things about the place, I had to judge for myself. After playing in the Whirlpool Compass Fountain for a while, the time came for us to say goodbye to J’s parents and J’s friends. I asked J if could order a couple pizzas to take home. She was on board, so I looked up the menu on the phone and placed the call. 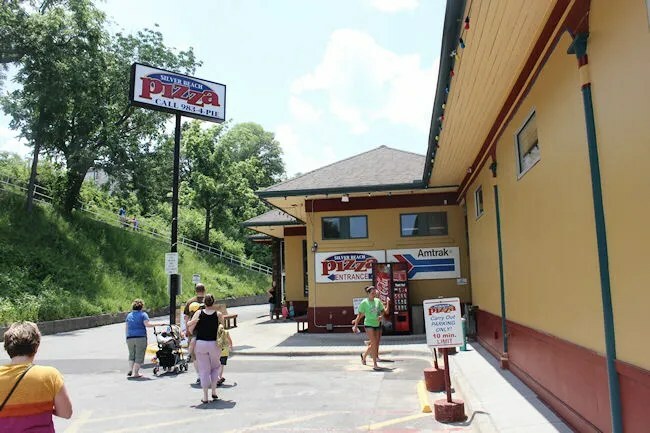 Silver Beach Pizza has a pretty amazing location right at the base of the bluff at the corner of Broad and Vine Street in St. Joseph. 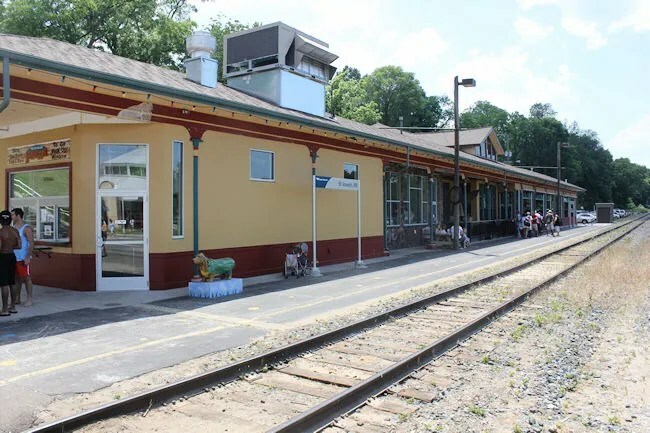 The restaurant is in the old depot and shares some space with the still active part of the depot which serves the Amtrak route that runs through St. Joseph. I never actually made it inside which is actually pretty disappointing. I love restaurants in old train depots. In addition to seating in a large bar area, there is an outside patio that overlooks the train tracks and gives you a pretty good view of the lake just down the road. I’m not usually the person who orders specialty pizza, but damn near everything on their specialty menu sounded amazing. Instead of my typical half cheese, half pepperoni order, I ordered a medium Palladium pizza for J and a large Fiery Chicken for myself. The pizzas took about a half hour to cook, so J and I walked back up the bluff to our car. We had to unload some stuff for Grandma and Grandpa and L was getting a little restless. She had a pretty big day. After saying goodbye to the grandparents, we drove back down to Silver Beach Pizza. There is some carry-out parking up front, but it’s in a weird spot. Instead, I drove around to the back parking lot and put my flashers on in a no parking zone next to the carry-out window. I mentioned I never saw the inside because they have an “Express Carry-Out Window” on the outside of the building that opens up to the bar. There’s a person working a cash register and a phone right on the end of the bar. I stepped up to the window and gave him my name. He said my pizzas were just coming out, so we settled up on the bill, which was an even $37, before he headed in to the kitchen to get my two pizzas. Once we got back on the road, J had a hard time waiting. She asked if the smaller box on top was hers. I said it was so she reached to the back to get it. 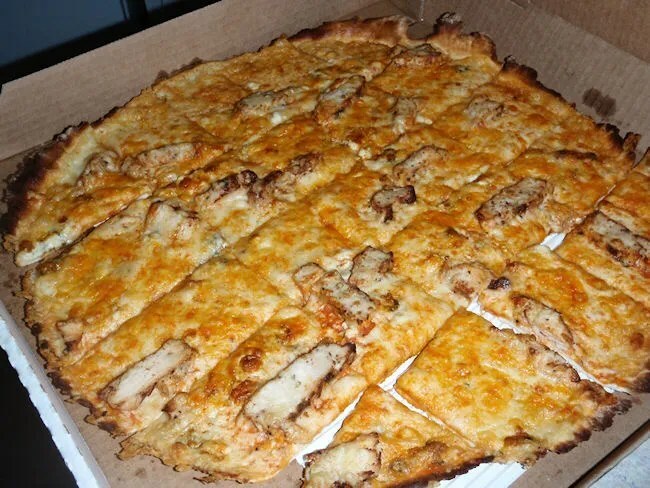 The Palladium is a four cheese thin crust pizza with Mozzarella, Colby Jack, Provolone, and Romano. 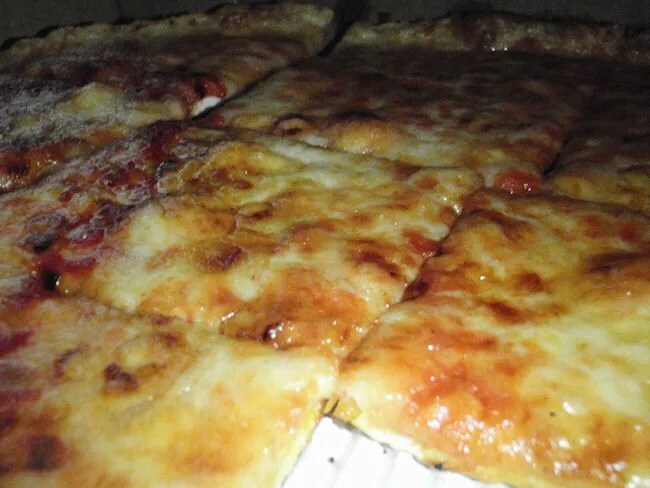 Both of our eyes lit up when we saw a golden brown, thin crust pizza cut in to squares. The crust wasn’t as crispy as we liked it, but it had a chewy consistency that was actually very delicious. The combination of cheese was interesting and gave the pizza a unique flavor. J said it was a little greasy, which to me, is the sign of a good pizza. The Fiery Chicken was another really interesting combination. This pizza has Frank’s Red Hot Sauce, chicken, and bleu cheese. I absolutely loved this pizza. The only thing that beats it is still my favorite Chicago pizza, but this thing is damn close. The Frank’s Red Hot gives it a little bit of a kick and the tangy bleu cheese adds another layer of depth to the four cheese blend already on the pizza. I was so sad when I pulled the last little square out of the box. 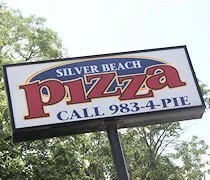 I hate to put it like this, but Silver Beach Pizza is by far the best pizza I have had since moving to Michigan four years ago. There are lots of reasons to go to St. Joseph in summer. 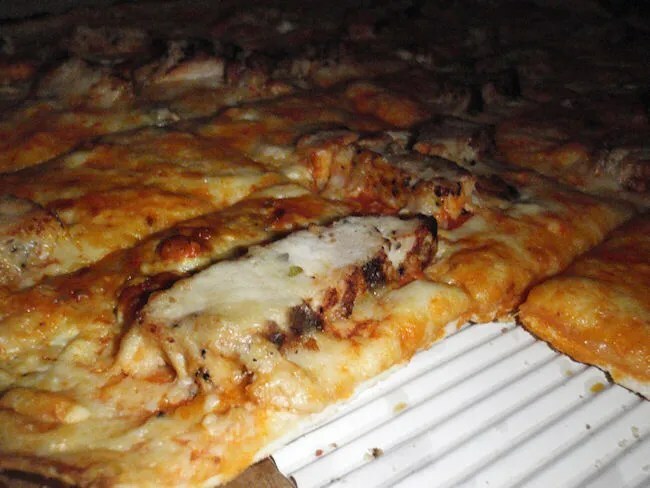 Silver Beach Pizza is a reason to go to St. Joseph any time of the year.